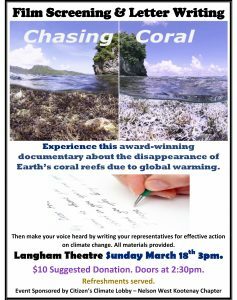 Experience this award-winning documentary about the disappearance of Earth’s coral reefs due to global warming. Then make your voice heard by writing your representatives for effective action on climate change. All materials provided. $10 Suggested Donation. Doors at 2:30pm. Refreshments served.